Pusseshun iz nien poynts in teh lore! Would you mind bringin us the remote, while yer up? An a snakk wud be gud, 2! Ai always wundered… Wut sorta root? We do nawt haz dis drink in Oz! Ohai, mantari! [ohai] Wicked peedia sez sassafrass. Is much more delish us than that sounds. Actually in Oz we have a drink called Sarsaparilla which is a reasonable substitute for root beer! I’m seeing fans liking teh lols, and mebbe a few uvvers enjoying learning abowt tehm. I’m also seeing, on average, nawt so many comments. Ai finkin, non-fans are getting a bit lost, and even fans can has not much tu say except a few extra lines here n there. So… I are gonna use teh few I can has left, altho bein careful nawt tu repeet subjects, and let it wind daon. Frum here on, if teh odd Python lol comes in, will just use it in teh regular flow. Then inna week or tu we’ll start kitteh colour theme weeks – a week starring obnp kittehs, a week of teh callycos an torties, a week uv midnite an tuxie kittehs, etc etc. Sound guds? Nah, nawt obsessing… much. That be my story an I stikkin tu it. I duz watch patterns an rhythms, tho, an try tu adjust fings tu encorrije peeps tu be aktive when I can. Nawt always pawsiblol, I know, and is menny menny factors, an sumthymes I guess rong (or guess rite an teh uvver factors are biggererer), but wurf trying. MP iz nawt mai kyned uv hoomer, but Ai rispekt teh rite uv dem az fyned it ufnee! Doan’t ubjekt 2 naow an den – we aer awl, fank CC, diffrunt an diffrunsiz maek lief moar rich! p.s. 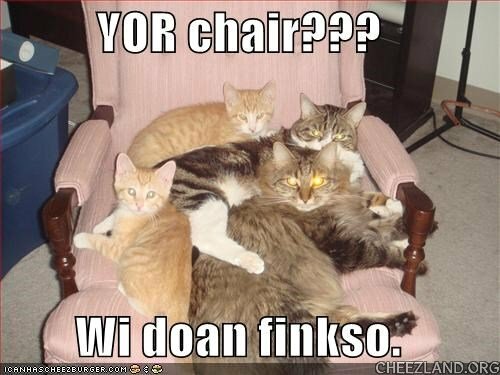 u dunt haz tew poast doze larst cupple ai sendid, ai alzo knowz ai got a bit karried awai maikin lols dere! I agree (aifinkso). I very much enjoy’d MP munff, eben if I wuz too bizzy tew participate berry mush. Deez awr the events dat make cheezland fun! I nawt basing it onna singlol lol – I are crazy but nawt THAT crazy. I are basing it on lols postid at times uv day an week that normully am relatibly active, bein repeetidly lower traffic on MP lols but moar or less normul arownd tehm thru teh full week, an stuffs lyk that. Yep, cud be lotsa uvver reezuns, and there be an eggsepshun or tu, but, well, frum here iz kinda a pattern. I ARE gonna use what I still has, unless is srs subject repetition (o-so-menny “french taunting” lols I can has…) – then will keep fur laters – or spesific reezuns tu nawt use (eg, sorces). Wud run owt this coming week ennyway. The goaww stuffs mite just as well be “sumwhair offa teh innerwebs, sumwhair, ennywair”. Iz a few similar sites peeps okkayshunally used tu use fur sorces befoar I wurked owt teh site polisy as far as bein ablol tu gib SUM sorta sorse. Had stuffs come in fownd on there taht eever was watermarked and cleerly nawt free fur use, or a kwik serch found it an it wazzint. Admittidly, teh saym can be sed abowt teh stuffs on ICHC, sum uv which I KNOW am copyrited an shud nawt be there, but if I disallowed stuffs frum ICHC I mite as well shut daon teh site. *sigh* Izza dilemming: wantin tu keep Cheezland moar ethical tehn teh usual if-it-are-onna-innerwebs-that-meens-it-are-public-domain site, but keepin Cheezland goin, tu an nawt repressin teh creativities. Have made teh odd ekseption on grounds uv “all ober teh innerwebs an no pawsiblol way tu find sorse” but try nawt tu. Am dat why the re-caption me pics neber got published? I was going to resume dat but found owt dat only 10 of the 30+ dat I submitted got posted. I fotso I emeowed you bowt that last summer. Some of the top-rated comments worked well as comments but not so well as captions, some had a specific context in recent events and made little or no sense on their own, there was one that any caption suggested in the comments would have been alcohol-related which is okay in comments but I’m trying to avoid in posts, at least one or two led to crazy amount of text on the pic… most of the comments in caption-me posts rly don’t work so well as stand-alone captions. Wow! Seems awl so complimicated foar just putting unaltered captions on pics dat udder peeps fot of. Good enough for comments, I figyoord good enuff for a post. OK, will try to find sum udder way to contribute. That kinda covers a lot of things about Cheezland: more complicated than it looks. BTW, I DID tell you this, last summer around the time of the boops. Take yor wurd foar it! Jes let me gno wen yew plan tu update, and I’ll follow up behind yew and re-install teh boops. I’m really sooper bizzy at wurkity rite nao, but I’m sure teh cheezpeeps will understand if teh boops don’t work for uh little while until I can git tu dem. I fot I gabe yew duh .PHP file edits. If nawt, I’ll dew dat dis time. You did – but while I can do some html and css, once it gets as far as mucking about with the php, it’s outside my skill set and I can’t fix it if I bork it. Eben tho I can (usually) fix it, backups (a.k.a. file copies) are still my friend. Srysly, PHP edits are no more risky than CSS edits. At least the way I did dem. If you are comfortable with restoring the comment/nesting spacing, den you have gno reezun tew fink dat yew coodn’t do duh boops too. I haven’t looked at the Submissions guidelines in a while – that particular paragraph really isn’t phrased well, it’s sort of ambiguous and not at all clear that ICHC is the one massive exception out of sheer necessity. I’ll fix it to clarify. Otay — no poblano — Aye gets it — no poblano atta awl — ICHC am berry EZ to ooze!! Okay, fixed, updated, and I hopeso clarified – been about a year since it had been edited. I dunno — ifinksew a fronch tauntin dae would bee da bomb — prolly cud nawt stawp LOL’in …..
Only fur teh fans, aifinkso – those whu nawt gets Python humur wud be board tu teers awl day. Izza balinsing act. One ob the byootimus fings abowt cheezland iz dat it givs peeps a nopportunity to appreciate new fings. I (not too) often git board wif sum stuffs, but wen I take the time tew lern abowt dem, I find dat I do hab an interest. For eggsamplol, (not picking on Lungdoc), some of duh Shakespeare stuff dat yoozd tew go ober my hed and made mii feel stoopy coz I didn’t git the references am teh moast enjoyablol nao. Coz I wanted to participate despite not gettin’ it, I looked dem awp and discovered how inventful and ufnny dhey reely wuz and LOL’d. Nao I luuk forward tew dem. Dat wuz troo eben in DOP times. Cheezpeeps iz the most diverse community dat I yam uh part ob, and I always end awp appreciating awl the contribyooshuns, eben if I don’t get dem at furst. Ai wil (very) belaytedlee say tho….ai hazza dissapoynt at teh kansellayshun uv Pyfon munff. Dere iz alwais tymes wen teh kommints r at lo ebb, noe madder wat teh lol subjekt is. An wunst a day duz nawt seem oberbord, evin iffen wun er tew er haowmennee fowks dunt git teh hoomer. U mus dew wat u feel iz rite fer teh site, ai kno. Ai hoap dat at teh verree leest wee kan stil see teh Pyfon lols peeps maid az part uv teh rotayshun now an den. It nawt so much got cancelled as nawt being actively encorrijed due tu mediocre response tu it azza event. Srsly, nawt much stuff tu use, which wud meen bugging peeps fur submissions tu keep it going – mostly, wif themes peeps hazza innerested in, I gets a day’s wurf nd then a bunch moar late teh day befoar, oftin leeding to having to trying to balinse inclusiveness wif repetetiveness (putting stuff at very diffrnt times of day halps, tu a point). Hao menny times non-fans wanna see variations on teh Spanish Inquisition or teh French taunting? I tries tu avoid tuu much similarities no matter what we duing. About half of what I have left is from you alone, which is just fine coz tehy am varied an funny an clebber, but that nawt ekzactly sujjesting mass enthoosiasm. I’m gonna use tehm all (teh wuns uvverwise usable, that is), just nawt awl at wunce. If, fur teh rest of March, peeps send me Python lols that are NOT anything already covered, I’ll use it ASAP. But, especially given that I’ve already had to bug peeps for submissions in general, I’m not going to keep asking for specifically Python lols – which means that, unless there be a bunch frum uvver peeps comin in, Monty Python March am gonna run outta steam inna middlol uv this week. At which point Python lols go inna jeneral pool to get used lyk enny uvvers.